How can social media freelancers report on their client wins and successes? Demonstrating the return on investment (ROI) of your work to your clients is crucial to your success. This is especially true if you’re a marketing consultant working across a range of platforms or areas for each client. How can you show all the impact you’re making across social media, PR, and other marketing channels and how can you put this together without it monopolising your time? As a freelance marketing consultant, you’re faced with additional challenges compared with your agency counterparts. Whilst agencies are likely to invest in complex analytics tools to help report on scores of clients; for you, the cost per client simply isn’t worth it. Besides, at any one time, you may only have two or three clients you’re providing social media marketing support to, for example, the others might be SEO or PR clients. There are many sources of inexpensive analytics data. The majority of social networks have comprehensive analytics areas, as do management tools like Buffer and Hootsuite. Google Analytics is also a goldmine of information about user acquisition and behaviour for your clients’ websites. But you can’t just send them links to all the stats, right? You’ve been brought in to crunch the numbers and makes sense of it all! Effective reporting for digital marketing requires a series of evidenced points with some explanation as to what this means - looking back and moving forward. For the majority of clients, knowing the return on investment each month is what keeps them on board. PowerPoint is definitely still the choice tool when it comes to presenting results each month. It provides the flexibility and functionality needed to produce great reports that combine images and copy. Whilst Word is clunkier in terms of producing something that looks great, if the report is more text-heavy, Word is the easier choice. Of course, if you’re freelancing or perhaps a digital nomad, your time is precious. You might be billing based on your time or deliverables – reporting on your work needs to be as efficient as possible. Clients don’t want to be billed for reporting time and you don’t want to have to report in your spare time when you could be relaxing, working on other things or building your business. The client has chosen you as an individual to deliver the work. They could have looked to employ an agency, learned the skills themselves, or employed someone in-house! Showing your personal expertise and compassion for the work is paramount and can be done by way of an introduction to the report or in a summary section. Most people want to see some headline facts or figures straight away. This is especially true if your point of contact needs to show the report to their seniors or other members of their team. You know that not everyone will go through every last detail of a report, so you need some simple, easy-to-digest figures right at the start. Furthermore, you need these figures to be great. It’s no good telling your client about a 0.2% increase in Twitter followers or a 5% drop in web traffic. In an ideal world, these headline stats, alone, should demonstrate positive ROI. Having clear sections to the report helps keep the client’s attention and compartmentalises areas of focus, platforms, or individual campaigns. 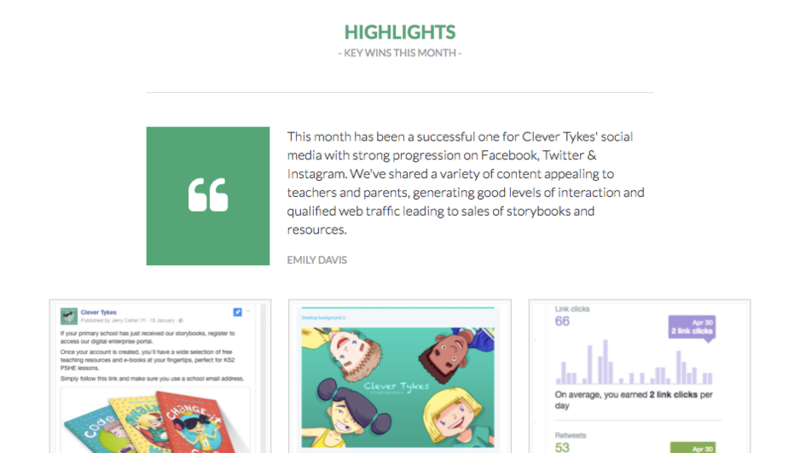 This enables you to hand-pick the highlights from each segment and dwell more on the areas you have focused on during the month or have yielded the best results. Remember PEE from your essay writing days? Each of your sections should comprise a series of points you want to make, a screenshot or stat that backs this up, and an explanation or interpretation of this point. Humans are creatures of habit; so getting people in a rhythm like this helps with the ease of understanding of the report and your work. It also keeps your report lean because there’s no place for waffle! It’s all well and good flaunting your wins and qualitative successes, but are you doing what the client needs and do you represent good value for money? The monthly report is your chance to hammer home all the great things you do and ensure keeping you on is a no-brainer! You never want to be in a position where the client doesn’t understand why you’re pursuing your course of action or where they think you have deviated from the agreed plan of a certain approach. It’s a nice touch to reiterate the objectives of the work and invite a discussion about this in case of misalignment. Tools like PowerPoint and Word enable you to achieve all five of these features. They also facilitate pretty branding and other customisations. The biggest problem faced is collating the information from all of those sources and formatting everything together. This is made all the more challenging, as a freelance consultant, because each of your clients is likely to need quite different reports. Depending on what you’re doing for them, what their goals are, and their level of understanding in the field, each report will vary in length, complexity, and style. Flaunt might just be the missing link in your reporting process. All the hassle involved in segmenting the document, producing evidence, adding copy and formatting is minimised through the functionality of the platform. Unlike the majority of analytics or reporting tools on the market, we’ve kept our prices to an absolute minimum, making it the perfect reporting tool for freelance marketing consultants. At $5 per month, per client, with NO MINIMUM client numbers, we have a tool for everyone. Flaunt not only saves you time, but if you are using premium tools, you may find Flaunt provides suitably-professional reports, meaning you can do away with them. This way Flaunt may actually save you hard cash each month! Try Flaunt for free now.